I just love all the adorable Spring desserts I see on Pinterest. Unfortunately, with 4 kids running around, I’m short on time AND energy to recreate most of them. I want stop-you-in-your-tracks cute but achievable in the half hour I have free right before the kids get home from school. 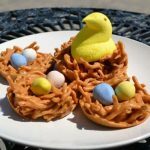 After doing an elaborate search, I found several different recipes that I was able to combine into this super simple yet totally adorable treat. Only three ingredients, five if you count the decorations and NO BAKING. You’re welcome. You can make them big or small. The small ones (made in a regular muffin tin) will hold a couple of mini eggs. The large ones (made in a big muffin tin) will hold a Peep. I also hid a couple of mini eggs under my Peep just for fun. You could substitute jelly beans or pastel M&M’s for the eggs too. Easy AND versatile! Place butterscotch chips and peanut butter in microwave safe bowl. Heat on 50% power in microwave until chips are completely melted, stirring every 30 seconds. Stir in chow mein noodles. Spoon mixture into large muffin tin cups and shape into nests. For smaller nests, use a regular muffin tin. Refrigerate until nests have set. 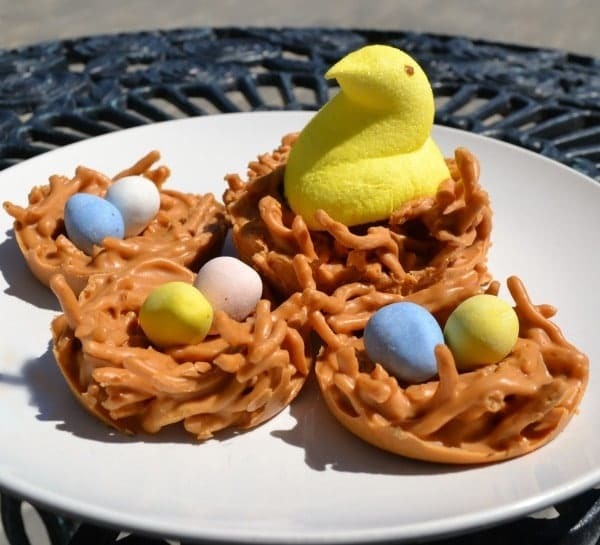 Place one Peep in each nest and surround with mini eggs. Looking for even more Spring-themed cookies? Check out these recipes from some of my blogger friends. Well aren’t these a delight! What a fun way to use chow mein noodles! I thought the same thing when I saw the different recipes that used them. A couple of my kids don’t like coconut so I was glad I found an alternative for making “nests.” Thanks for stopping by! These are so sweet! My daughter would have a blast helping me make these. Pinning! Thank you! I appreciate you stopping by. Love your party!! These are almost too cute to eat! Thanks for sharing in the Thursday Favorite Things link party! Super cute and yummy! My son looked over my shoulder and said “YES!. These are just to cute! I especially love the Peep being right in the nest… adorable! 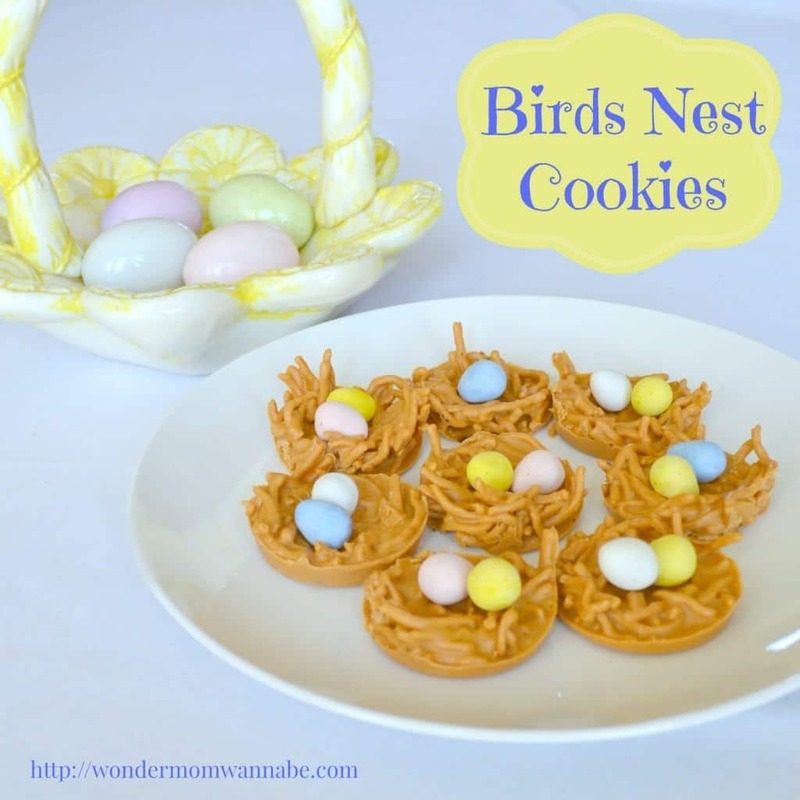 What a great spring treat, I love the ‘no bake’ and how easy they are to make. The combination of the peanut butter and butterscotch are a delicious combination. Happy Holiday! I made these using darker chocolate as well as just rice krispies. The perfect Easter treat. I remember having something like this a long time ago. I loved them! 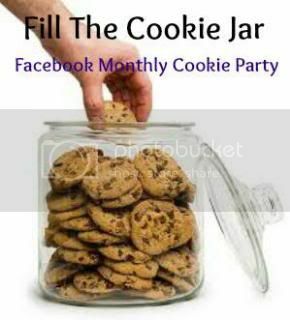 I am so glad you shared the recipe with the Fill The Cookie Jar group. I will make some of these for our Easter celebration! Finding and using a no bake recipe was a great idea. Especially for this time of year. I think my granddaughter would love these, they look delicious! My mom always made something similar for Halloween (minus the eggs). It was always one of my favorite candies growing up.